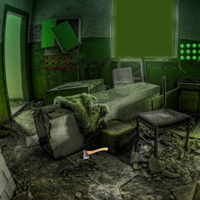 WOW Freaky Abandoned House Escape is another point & click escape game developed by WOWEscape. In this escape game, someone trapped you inside the Freaky Abandoned House. You need to escape from there by finding useful objects, hints and solving puzzle. Humm I put the bottle and cap down and boot showed up by it's self??? Well made it out but never used the 5 cans?? The cans are where the red boot came from. Though you didn't need it as it magically appeared when you put the other two items down. I had to actually put the boot in place after doing the cans. No magic here for any of the puzzles or items. Maybe it all depends on the sequence in which you do the puzzles? Also could do the 5 shapes puzzle without having to look at the wall clue with the 3 in the triangle.